The Start-A-Stack is our most popular Elfa Drawer combination for all-purpose storage in any room of your home! It features three 2-Runner Mesh Drawers, one 1-Runner Mesh Drawer and Back Stop Pins. The fine weave of the mesh prevents small items from falling through. We offer a variety of Drawer Accessories that you can add to customize your solution. Elfa is an entirely customizable system - if this isn't exactly the solution you're looking for, try our Elfa Drawer Planner. Platinum Elfa Mesh Start-A-Stack is rated 4.9 out of 5 by 134. Rated 5 out of 5 by Janfranks from Great buy Strong shelving unit, Well made and easy to set up. Drawers slide easily even when full. Highly recommend Love the white it’s so sleek and if you need more space you can stack. Rated 5 out of 5 by HPIII from Just right Drawers Not to expensive and not as cheap as some plastic drawers that these are replacing in my garage. Perfect size to fit on my heavy duty shelving for storing a load of things I don't need but have to have. Easy to assemble but I would like to have an option to have the "feet" be flush for the bottom. Instead, they come with feet that will stack on top of another unit which is great if that is what you want. I don't want that so I had to saw cut the pegs so that the entire unit will stand flush with the ground. Rated 5 out of 5 by GTES from BEST Closet Organizer I use this for clothes in my closet and LOVE it. It can also be used for many other purposes around the house, especially with the variety of drawers. Rated 5 out of 5 by otfusiongirl from Excellent storage solution I purchased this for my 10 year old son's closet. I had a plastic bin before that kept breaking and he couldn't pull the drawers out. This is a sturdy, clean, functional storage solution to a closet that my two sons share. It makes it easy for my son to get to his socks, underwear, belts, etc and it looks nice too. Definitely a great piece and even better that it was $30 off when I purchased it! Rated 5 out of 5 by CRUSS from Quilting Studio I have used the Elfa Storage system since 2012. Adding a unit or two when budget permits. I LOVE my Elfas! They help keep my tools, fabrics, kits and notions close at hand and organized. What more could any quilter want? Rated 5 out of 5 by SJFAUSKE1 from Perfect sturdy instant drawer space So happy I purchased these stacking drawers. So well designed and sturdy. It fits perfectly in the space my dishwasher used to be with space left on the side to store my longer baking pans. Just ideal. Thank you! Rated 5 out of 5 by Hanaslocoshoppe from Easy to put up and durable I have a tiny closet so I decided to add this item in my closet to make more space. It creates so much space in the tiny room. It looks nice and cute. I also purchased a dymo label maker from container store and named each drawer. They look so organized and noce to see. My closet turned from tiny mess to a nice and modern looking organized piece in my room!!! Rated 5 out of 5 by JMS4E from Excellent quality product. Sturdy, easy to assembly, plenty of drawer space. Rated 5 out of 5 by JMtwins from Sturdy as can be! Love this product. I have 20 year old Elfa bins at home and they are still in great shape. Never slide out of the railings or cause any other problems. Can’t recommend it enough. Rated 5 out of 5 by Grammyx3 from Beginning of closet redo Extremely pleased with this Elfa mesh stackable. Plan to add another unit asap. Rated 5 out of 5 by 2guppies from Perfect Needed a nice looking, quality shelving unit for semi-useless small closet in new RV. This fit perfectly. It was easy to assemble and looks great. Rated 5 out of 5 by Legend from Sturdy and looks good. I like this product. It is all made and looks good, however, they do have differing width options, they don't have different height options which they should rectify. Rated 4 out of 5 by J3nnif3r8 from Freed up a ton of hanging space in my closet! I bought two of these start a stack kits and two melamine tops for my walk in closet and I’m glad I did! I was able to free up an entire bar on the other side of the closet where my pants used to hang. They fit all of my jeans, dress pants, leggings, yoga pants, shorts, you name it! They were so much easier to assemble than I thought they would be, I did them myself and it only took me a half hour. I also bought the clips to clip them together. I want to buy more but then I’d block my baseboard heat in the closet so I’m debating. The only bummer is I bought a bunch of the elfa drawer dividers in the store and I wish someone had told me they don’t work in the frame. I wish the cashier or the person who got them from the back for me told me this. Now I have to return them and the store is an hour and a half away. Rated 5 out of 5 by BayAreaTCSLover from Great drawers that hold a lot I got a custom Elfa drawer combo rather than the standard drawers shown here, but it only differs from this one slightly. I LOVE it! I could customize it to the space I have and it really holds a lot; in fact I have even more storage space in it now than I actually need. Really tidied up my office space. Rated 5 out of 5 by Minti from Hold so much...love it! These drawers slide in and out so smoothly! I wear size small and I could make 2 rows of shirts in the deep drawer. I wanted a top for a flat surface to fold my clothes on but still be able to see through so I got the smoke solid drawer lid and they work...not a perfect fit but good enough. Rated 5 out of 5 by GG123 from Love it I purchased this unit for my small business that shares a space in my walk in closet. I'm definitely ordering at least 3 more to use for business and 1-2 for my daughters bedroom. I ordered white....very clean look. I purchased a rubber mallet but it wasn't working........so I used an old rag (it will put a hole in whatever you use) and a hammer. I finished my setup process a lot faster an when I used the mallet. I would recommend to a friend. Try to purchase during the aunnal elfa sale but if not it's still worth it! Rated 5 out of 5 by J0728 from Very useful I have two of these and this is my third. I love them for organizing! Rated 5 out of 5 by Sheridan from Best Tool For Organization The elfa start-a-stack is the perfect tool for additional drawer space. It is small enough to not clutter a room and it provides a great amount of drawers and enough space inside to fit anything you need! I use mine in my college dorm room to provide extra drawer space for my clothing and towels. It has been a life saver! Especially since the university doesn't provide a lot of drawers for students. It is also small and doesn't take up a lot of space which is great for a small area like a dorm room. Best purchase I've ever made! Rated 5 out of 5 by Luv2OrganizeEverything from Love these!! I initially bought two of these to use in our closet and, upon assembling them, saw you could stack them. So I stacked them and right away ordered two more for the other side of our closet. They work great for underclothes, pajamas purses, etc. Definitely recommend! Rated 5 out of 5 by Flaca from Great organizer! I purchased this to organize a tangle of odds and ends underneath a staircase closet. It is at an odd angle, but was able to customize the fit with the various dimensions available in the elfa system. I had duffel bags, snorkel equipment, sewing fabric all piled atop each other. I ordered this elfa system: two 2 runner drawers, two 3 runner drawers and the top. Fantastic! the drawers are nice and deep; everything fit very nicely. I purchased the labels. Very organized. Love elfa! Rated 5 out of 5 by TexasSunshine12 from Fantastic I bought these to help organize our master closet. Wish I had purchased years ago! They assembled easily, are sturdy, and hold a TON of clothes. After this experience I will be adding elfa to my cabinets, pantry, and many of our other closets. Rated 5 out of 5 by Bdyer from elfa stacked drawers did the job! I used four of these in my office closet along with other elfa shelves and products. It is so nice to go into the closet to get something and not have to move several items to get to the one I need. 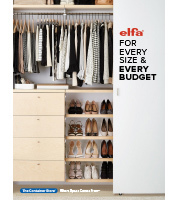 I can't wait to create more unique storage spaces with elfa in my home. Rated 4 out of 5 by Realtor from Great Gift for College Student My daughter won the Platinum Mesh Start-a-Stack at your college night event. We purchased the sliding file attachment so she could keep her files organized and in reach. The drawers storage can be used for various items. Rated 5 out of 5 by marionb from Awesome drawers I have a very small bathroom vanity. I purchased a narrow 3 drawer Elfa unit and it fits perfectly on one side of my little vanity. Easy slide and keeps all my items tidy and organized. Rated 5 out of 5 by Daysunshine24 from Great product I love this mesh drawer. It can easily be assembled, stacked, and has countless uses. I have four so far. Rated 5 out of 5 by Katiep12 from Great Storage Solutions! I have 2 of these in different sizes and wish I had a couple more. They are incredibly sturdy, come in a variety of sizes to fit any space, and they really are everything all the reviews say they are and more. Easy to put together (don't be intimidated, it's not as hard as it looks# and you can get different size baskets to fit your needs. Wouldn't recommend getting the short baskets unless you have a specific idea in mind for using them #works good for scarves) because they really aren't tall enough for many uses. One hint--make sure you use the back stops because otherwise when you shut the basket, it goes flying out the back side. I recommend getting the top for it as well so that you actually have a table top to use and it can withstand a lot of weight. Wheels are great on these and it rolls easily. Worth the money,and if you get it on sale, it's even better! Rated 5 out of 5 by Wsfld from great option My walk-in closet is pretty basic- couple of bars for hanging clothes and a shelf above them. However I needed a drawer option to store work-out clothes and utilize the space beneath my shorter hanging stuff. I shopped around and found other options not as nice, but still pretty pricey (for what I'd expect to pay#. I got this on sale and it fits the bill perfectly. It was easy for my husband to put together #although he is pretty handy, but I could have done it myself if I had to). The drawers slide well and I appreciate the draw stays so I'm not accidentally yanking the drawers out. Feels like a high quality product. I like the mesh to let the clothes breath, but nice enough that things won't get snagged. Highly recommend. Rated 5 out of 5 by daziemae from My closet The previous drawers in my closet were extremely difficult to operate. My husband surprised me by replacing them all with your easy to construct mesh drawers. I now have a totally complete Elfa closet that is the envy of all my friends. I would highly recommend Elfa to everyone. How. Many adult tee shirts will a 2 runner drawer hold? Depends on if you have men or women's shirts. I fit easily 20 T-Shirts if I split the drawer in half (10 T-Shirts on each side). Since Pullover's are thicker I would say about 10-12 Pullover's. Are the bins and the entire unit strong enough if all 4 bins are filled with heavy books? Don't want to have it loaded then fall apart to hurt kids. This is not a even a medium-duty drawer system. We&rsquo;re storing only clothing in our and the drawers have pancaked down several times. I wouldn&rsquo;t recommend it for anything heavier than socks, underwear and a few t-shirts. How much can you build off of this drawer system? I'd like to purchase the Start-A-Stack drawer combination for some crafting storage; however, I'm curious as to how much you can build off of this drawer system in the future. It is possible to add an additional drawer frame to make the system taller if I need more space? Thanks! Yes, you should be able to do this because you can purchase a solid top for the drawers. Then you can just stack the next set on top. Does this come with the frame or is it only the drawers? I am concerned drawers are wire and will snag clothing. Has anyone had trouble with this? It's pretty smooth--more like mesh than wire since nothing sticks out. I doubt clothes will get snagged. Are the drawers also included in this set? Thank you! Where can I find the honeycomb dividers for small top drawer? A link to our 32-Compartment Drawer Organizer is provided below. Is there a taller version of the start a stack?